The ECO linear stage series builds upon Aerotech’s long tradition of producing low total cost of ownership motion designs. Excellent positioning specifications, high stiffness, and a variety of options and features combined with economic pricing make ECO stages an ideal choice for applications where robust motion performance is needed. 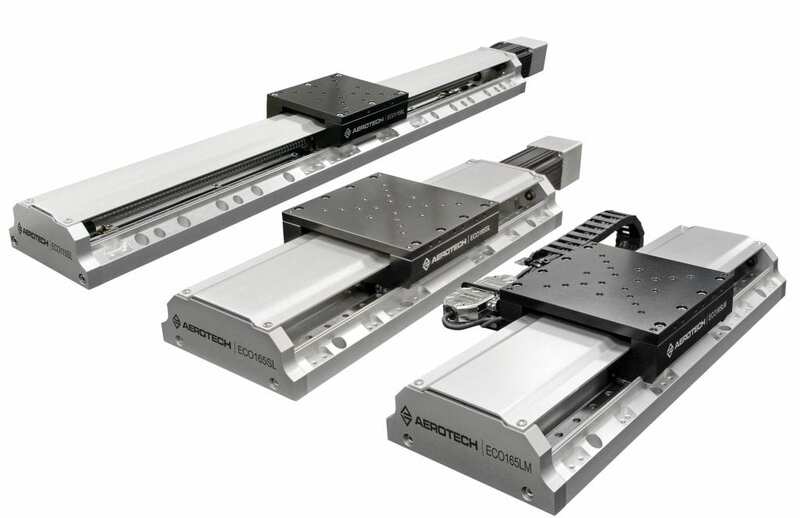 Long-life precision recirculating linear bearings, along with Aerotech’s machining and assembly craftsmanship, enable the best geometric performance per unit price on the market today. Unlike other low-cost competitive motion stages, ECO stages can be integrated into complex machines with the assurance they will perform at a high level and outlast other machine components. The ECO-LM series direct-drive linear motor stages are optimized with high precision, noncontact linear encoders. The precision noncontact encoders enable minimum incremental motion to 10 nm with micrometer-level repeatability. The optional HALAR factory calibration improves positioning accuracy to ±1.5 µm. The ironless forcer coil provides high force with zero cogging for smooth velocity and position control, ideal for applications requiring outstanding contour accuracy and smooth velocity profiling. The linear motor has zero backlash, no windup, zero friction, and excellent dynamic responsiveness. ECO-LM stages are available in 17 different models with travels ranging from 100 mm to 800 mm and speeds up to 2 m/s. Configurable cable management solutions are available for single and multi-axis systems as standard options. For even more cost-sensitive applications, the ECO-SL series includes several NEMA 23 stepper motor and brushless servomotor options. The ECO-SL series is designed with many standard features and options that make the design adaptable to specific applications. Several encoder options provide electrical resolutions ranging from 0.5 µm down to sub-nm. A holding brake can be added for vertical applications. A motor fold-back kit is available for space-constrained applications to reduce the overall stage length. ECO-SL stages are available in 27 different models with travels ranging from 50 mm to 800 mm and speeds up to 300 mm/s. ECO series stages offer many options to fit the exact requirements of numerous applications. The flexible, cost-effective design easily makes them the best value linear stage series available today. For further information, please contact Steve McLane at 412-967-6854 (direct), or via e-mail at smclane@aerotech.com.